During its four-day tour stop at the Hermosa Beach Open, the AVP featured up-and-coming stars and seasoned veterans, while more than 56,000 fans showed their support with T-shirts and signs promoting their favorite players. In the last competition of the weekend, the top-seeded men’s team of Theo Brunner, 33, and John Hyden, 45, claimed their first 2018 AVP title with a thrilling 21-19, 16-21, 16-14 match against No. 3 Billy Allen and Ryan Doherty. “We kept them (Allen/Doherty) on edge a little. That was good,” Hyden said. The women’s competition featured up-and-coming stars Sara Hughes, 23, and Summer Ross, 27, who took home the women’s championship and their second 2018 AVP title. Seeded No. 1, Hughes and Ross eliminated the No. 2 seeded team of Kelly Claes and defending Hermosa Beach Open champion Brittany Hochevar, of Torrance, in the semifinals. The match featured long rallies but the strategic plays of Hughes and Ross produced a 21-18, 21-19 victory. Following a hard-fought three match semifinal win against No. 4 Caitlin Ledoux and Geena Urango, the “A-Team” of third-seeded Alix Klineman and April Ross faced another challenge in Hughes and Summer Ross. With the score frozen on match point and the crowd on their feet for over 30 minutes of play, Hughes and S. Ross edged the visibly exhausted Klineman and April Ross, with a final score of 21-19, 19-21, 17-15. The male and female winners were presented with AVP Championship skateboards. Klineman, who has partnered with April Ross this season, is optimistic about the team’s future. The duo won the AVP Austin Open and had third-place finishes at New York and San Francisco. Internationally, the team has four top-10 finishes including a first-place at The Hague, Netherlands in January. One of the highlights of the Hermosa tournament was the return of local legend and Olympic gold medalist Eric Fonoimoana. The 49-year-old took time away from his duties at Elite Beach Volleyball and the foundation “Dig for Kids” to come out of retirement and inspire his many students. In between pro action on Stadium Court, national championship matches were held showcasing the top teams from the AVPFirst program. “Winning the national championship was an amazing feeling,” Monk-Heidrich said. 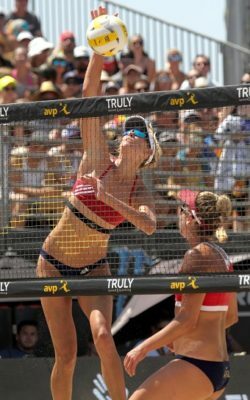 “The finals were played on main court in the AVP stadium and having all of those people watching and cheering it really felt like we were in the AVP. The next AVP 2018 Pro Tour stop is the second of three Gold Series tournaments, the Manhattan Beach Open, which will be played August 16-19 at the Manhattan Beach Pier.